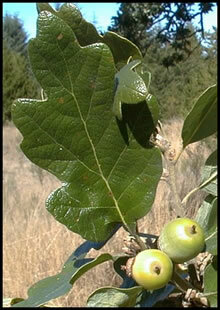 Oregon white oak or Garry oak, Quercus garryana, Dougl. ex Hook. Watering every 2-3 weeks during the first growing season and weeding young plants until they are 6-10 inches tall are recommended (Wilken and Burgher 2000). Some form of protection from seed predators and/or herbivores is recommended (Silvics of North America). Franklin, J.F. and C. T. Dyrness. 1973. Natural Vegetation of Oregon and Washington. Oregon State University Press, Corvallis.